BRUSSELS – In the midst of the Greek financial crisis and the ensuing uncertainty throughout the European financial market, the European Commission has stepped forward again and called for an EU-wide financial transactions tax. 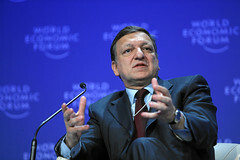 In an address to the European Parliament on September 28th the President of the European Commission José Manuel Barroso made the official proposal to instate a financial transaction tax to be applied to the activities of banks and financial institutions in countries across all European nations. The proposed tax will be applied a wide range of financial transactions between financial institutions operating in European countries. The President said that the tax would be charged at 0.1 percent for transactions of bonds or shares, and at 0.01 percent on derivative products. The tax would be applicable to each party participating in the transaction. Each EU member state would be free to apply higher rates, if they choose to do so. According to José Manuel Barroso the proposed tax needs to be levied simultaneously across all EU member countries in order to minimize the occurrence of tax evasion or major shifts in investment between European financial centers. Implementing the tax would also set the stage for further fiscal and legislative reforms aimed at creating a greater unification in European financial markets. If instated, the financial transaction tax would raise approximately EUR 55 billion per year. During his speech José Manuel Barroso said that throughout recent economic turmoil, financial institutions across the EU have received nearly EUR 4 trillion in guarantees and support, and it was time for the industry to repay its debts to taxpayers. He described the situation as “a question of fairness”, saying that it is the turn for the financial sector to make its contribution to the EU taxpayers.